Police special constables in Ayrshire are to receive special training to help them tackle rural crime. The awareness training sessions will focus on the theft of agricultural vehicles and livestock and the worrying of livestock by dogs. It will also include general security information for farm buildings such as barns, stores and fuel tanks. Special Constables from across Scotland are being trained in rural crime prevention between now and the end of December in a continued focus by Police Scotland to reduce crime in rural communities. Inspector Jane Donaldson, Police Scotland’s Rural Crime Co-ordinator, said: “In four dates throughout November and December, more than 50 Special Constables will attend “walk and talk” events on farm premises, starting this Saturday (12 November) in Auchterarder. 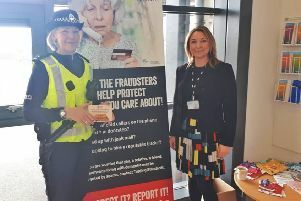 Inspector Laura Mackay, the national Co-ordinator for the Special Constabulary, said, “Many of our Special Constables live or work in rural communities and have existing knowledge and skills that we can build on by providing them will this awareness training on rural crime prevention. The training will focus on the key priorities identified by SPARC (Scottish Partnership Against Rural Crime). Police say residents in rural locations can assist them by taking simple security measures to reduce the opportunities for criminals.